Are you looking for a high-quality insulation contractor in Southern California or the Bay Area? OJ Insulation works with both builders and contractors in San Diego, Los Angeles, the Bay Area and the surrounding communities to install energy-efficient spray foam insulation for new residential and commercial construction, as well as retrofit projects. If you need to insulate any hard-to-reach areas of your home such as the attic, crawl space or any area with an abundance of wiring, spray foam insulation is the most energy-efficient and the easiest to install. If you are building a new home or commercial building, choosing spray foam is an effective way to save money on your monthly heating and cooling costs. Our insulation experts will work with you to find the right spray foam solution for your insulation needs, and your budget. Contact our team of spray foam installers online or call us at (800) 707-9278 for a free estimate on your Southern California or Bay Area insulation project! Spray foam insulation is a material made up of isocyanate and polyol resin which, when combined, react with each other to create polyurethane, and expand 30-60 times the original liquid’s volume. 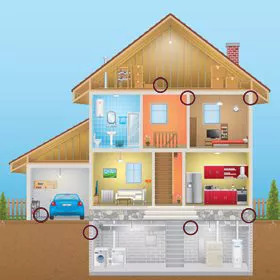 When it is used in home insulation, it is particularly useful for insulating even the hardest-to-reach spaces in a home, since it is applied wet and expands into a thick foam, fitting snugly in wall cavities, crevices and gaps. Call us today at (800) 707-9278 or contact us online to get in touch and request a free estimate on your spray foam installation! What R-Value Does Spray Foam Insulation Have? If you are looking at different insulation options for your home or business, you’ll undoubtedly come across what is known as an “R-value.” This is a number that refers to the capacity for an insulation material to effectively resist the transfer of heat. A higher R-value demonstrates a greater ability for a material to insulate a space. Typically, spray foam insulation provides an R-value of about 6.5 per inch, which is more than that of cellulose or fiberglass insulation which can have an R-value ranging from 3 to 4 per inch. Customers really notice the difference in those R-values during the peak heat of summers in Southern California, as well as the rare chilly winter nights. Contact our insulation experts for more information on spray foam and how it can help reduce your energy costs! OJ Insulation has been one of the leading insulation installers in California since 1984, and with locations across the San Diego, Los Angeles and Bay Area regions, we are poised to service any insulation construction project, no matter where you are. There is no insulation job too small or too large for our experienced installers, and when you work with our professional team of contractors you can have peace of mind that you’re getting top-notch service. To learn more about our spray foam insulation services or if you’re ready to start your project in Southern California or the Bay Area, contact us online today or give us a call at (800) 707-9278!